For the majority of people promotions and pay rises are the way success is defined. However, when it comes to running your own business the story is very different. You are responsible for your growth and success. This is where business goals come in. A goal is different to a list. A to-do list does not guarantee success whereas goals are meant to guide, define and shape your business in order to achieve. They give a purpose to your day and help you develop. Your goals might be based around aspects of your job such as things you particularly enjoy or perhaps the strongest elements of your business. Alternatively, your goal might be to improve and increase an area that has previously been overlooked but holds so much potential. As a small business owner, you have to define your own purpose (your business goals) so that you can be successful. How are you going to measure your goals? For each of your goals create a bullet point list of what qualifies as an accomplishment. Don’t be put off by the number of bullet points, the important thing is to make that goal real and attainable. Once your have broken your goals down into achievable bite-sized chunks, your purpose goes from being ideas in a notebook to tangible achievements. How short is short-term? How long is long-term? I would recommend no longer than a three year time frame – not too short that you end up “failing” (12 month goals) but not too long that you get bored and disgruntled (5 year goals). However the most important thing is that you set a time frame that works for you. If you know that you will fall off the wagon by the second year then aim for 12 months, alternately if you know that you won’t achieve enough in three years, go for a longer time scale. It needs to work for you. I am the person who writes down all their healthy eating goals, commits for a day and then eats four chocolate biscuits for breakfast. I have golden intentions but struggle to commit long term and take those all important first steps. So if you’re like me, once you have defined and qualified your goals, take it one step further. Visualise your ideal day-to-day. Write down anything that comes to mind when visualising your ideal work day – this is just a brainstorm of ideas and thoughts. Next, take a step back and organise those ideas until it makes sense. What is your first step? It might be finally clearing out that old bedroom so you have a defined office space or simply wrapping up projects that no longer align with your goals. Follow along on our brand audit series. We’re going to be taking you through all the key components of your business so that you can tweak, re-jig or just bin anything that no longer works. And with your new goals in mind, now is the best time to give everything a good new year clear out. Not sure what the brand audit series will cover? 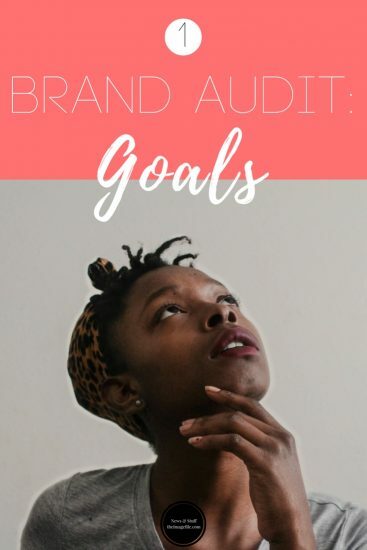 Check out our post last week where we give an overview of all the topics included in our brand audit series.